There are several forms of phototherapy. Narrowband ultraviolet phototherapy or “light” therapy is well established as an effective and safe treatment for many inflammatory skin conditions, particularly those involving large areas of the body. At Central Dermatology Clinic we utilise this therapy for a variety of skin diseases, particularly common conditions such as psoriasis, eczema and vitiligo. 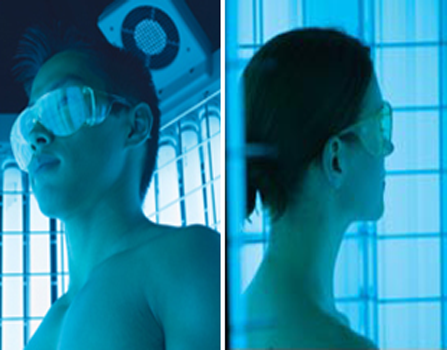 Phototherapy is NOT the same as indoor tanning beds or solariums. It works on the principle of ultraviolet light calming the immune response in the skin. The phototherapy device delivers an accurate, measured dose of a very specific wavelength (311 nanometres) of ultraviolet light. The dermatologist prescribes a dose of phototherapy specifically tailored to the patients’ skin type and the disease being treated. On average each treatment session takes approximately 30-60 seconds. Treatment is painless and patients can return to normal activities immediately following treatment. Our flexible treatment hours mean easy access to phototherapy treatment. Most patients require a course of 2-3 treatments each week for approximately 10 weeks. Your dermatologist will prescribe a course of treatment that’s right for you. Although results vary, most patients see improvements to their skin after about 4 or 5 weeks of treatment. At the end of the treatment course, most patients find significant improvement to their skin and many may be clear of their condition. Patients can be safely re-treated at a later date if their condition recurs or flares. Sometimes patients are recommended to undergo a maintenance course with UVB phototherapy to sustain results. Often work and family schedules mean missing treatments is sometimes unavoidable. We understand this and can alter your treatment cycle to cater for these unexpected events. However, we always encourage patients to commit to a full, uninterrupted course of treatment to achieve the best results. Patients are reminded to always contact us in case they cannot attend their scheduled appointment. How much does phototherapy cost? All patients receiving phototherapy at Central Dermatology Clinic are bulk billed if they hold a current Medicare Card, so there are no out of pocket expenses. Yes. However some patients may experience side effects with this treatment. The most common side effect reported is a sunburn-like change on the skin. Usually this is mild and a minor adjustment to dose will prevent this. Occasionally, mild rashes and itch may develop, particularly early in the course of phototherapy, but this is rare and usually settles within a week or so. Some patients find their skin may feel slightly drier and patients with darker skin types may find that their skin tans. Patients will be required to wear special glasses/goggles to protect the eyes. Serious side effects are rare with this treatment, even when large numbers of treatments are undertaken. It is often the preferred treatment for many skin diseases because it is generally much safer than systemic or tablet treatments and is particularly safe for women who are pregnant or breastfeeding. Patients undergoing phototherapy also generally need to use less steroid based creams. Current medical research confirms that even large numbers of phototherapy sessions do not increase the risk of skin cancer. All sessions are closely supervised by dermatology staff. Talk to your dermatologist at Central Dermatology Clinic to see if narrowband UVB phototherapy is right for you.